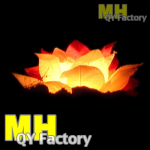 Water Lanterns | SkyLanterns, Hanging Lanterns, CandleBags. Lotus Water Lanterns: Paper Lotus flowers with a floatable base. Beautiful paper flowers that glow with Candles or LED tea lights. These are nice because they have a thick base so they float and do not sink! (most copies on the market have tray bottoms or bags stuffed with paper as a bottom. Needless to say, the price is great but they soon sink). Simply open the bag, weigh them down with sand or stones and place a tea light or LED tea light inside. Our various designs and sizes are suited for indoor (LED Tea light only) or outdoor use. The Water – Lawn Flowers can be used at dinner or placed around the living room to create a lovely serene atmosphere. They can be used in ponds and pools or used to light up gardens, yards. They provide a neat way to mark or enhance walkways. Wherever they are used, candle lanterns create a charming soothing effect for ideal for entertaining or just relaxing. Waxed lower leaves and Flame retardant upper leaves. High quality 18 GMS paper so they keep their shape longer. Wax Honey Comb corrugated squares in base to get flower petals above water. Since they float, they can be reused over and over.